“Peartree Young Britons have followed up their success in the Eastern Area Speakers’ competition by winning the national trophy on Saturday last. The trophy is a beautiful silver replica of the British Lion, and was donated by Lady Davidson, the chairman of Young Britons. As she is abroad with her husband, her place was taken by Mr J. P. L. Thomas, M.P., one of the Vice-Chairman of the Young Britons. The judges were Lady Lucus Tooth, Mr C Pearce, J.P., and Mrs E Soutter. 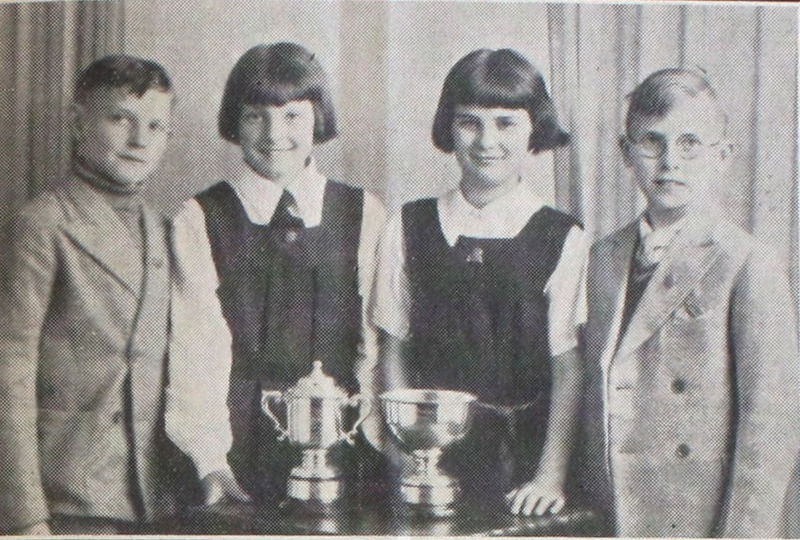 The Garden City team was trained by Mrs Frank Roe,was composed of Chairman, Pat Roe; Speaker, Nancy Collins; Proposer of vote of thanks, Cyril Holmes; Seconder, Charlie Gabell, and all the children are only eleven years old. Nancy Collins, as the speaker in the winning team, had the privilage of proposing the vote of thanks to the judges, and this was seconded by Nottingham, the runners up. The team was the youngest of the ten teams competing, and third place was gained by another young team-four little girls from Penarth in South Wales. The adjudicator commented on the good elocution of the children, so perhaps Young Britons will provide the future stars of the local dramatic societies. Would like to hear from you Joan As I have a lot of relatives named Armstrong. Nancy Collins was my father’s youngest sister. She was born in Ireland in 1926 and arrived in WGC with the rest of the family in 1933. She married a lovely G.I. Jim Berry after the war and went to the U.S.A. where two of her three sons still live with their families. I remember their wedding day, it was great fun! An older sister is now 93 and visits me here in WGC travelling by rail from Norwich. We lived at 7 Mill Green Road during the war years, the men were away in the army and R.A.F. including our grandfather who had already fought in W.W.1. All the women worked so we (brother Mick who later played solo cornet in WGC band before emigrating to Canada and cousin Peter Kibblewhite who lives in Norfolk) were looked after by our grandmother. We had a wonderful childhood.